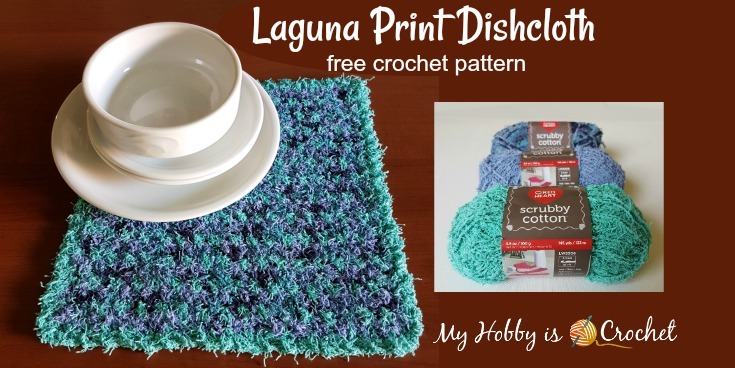 The Laguna Print Dishcloth is made with Scrubby Cotton Yarn by Red Heart Yarns, a 100% cotton yarn. 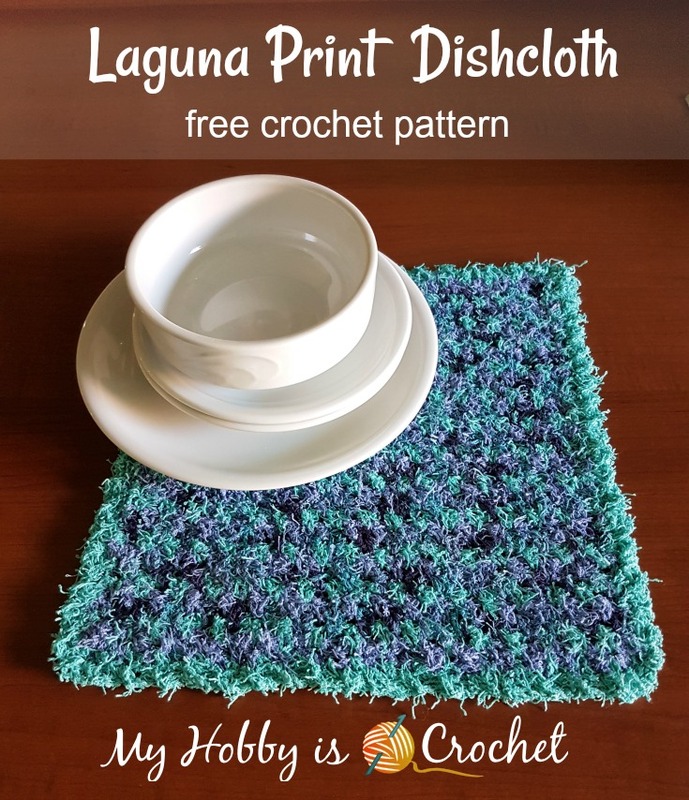 This yarn is absorbent, beeing great for dishes and bath. You can machine wash it and tumble dry on low setting. *Disclaimer: The yarn was provided by Red Heart Yarns. This post includes affiliate links and at no additional cost to you, I might earn a small commission if you decide to purchase your supplies online. Thank you! A while back I have received from Red Heart Yarns a few skeins of Scrubby Cotton yarn to try out. At first, this yarn seemed tricky to work with, because of its fuzzy texture, but I have realised that it’s much easier to work around the stitches or into spaces rather that into the top of the stitches. That’s why my first pattern choice was the crochet moss stitch, where the stitches are worked into the chain 1 spaces of previous row. If you haven’t worked with the scrubby yarn before, I recommend watching Marly Bird’s Video Tutorial on YouTube: How To Crochet with Scrubby Yarn. 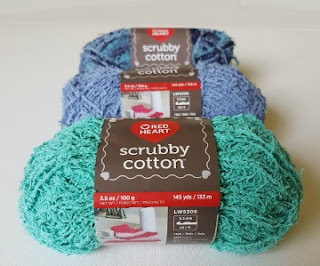 - 60 g total of Scrubby Cutton by Red Heart Yarns ( one skein in each color: Denim (color A), Fiji (Color B) and Calm Print Color C) From 3 skeins of scrubby yarn you can make 4 - 5 dishcloths. Click the yarn picture to buy Scrubby Cotton on Red Heart Yarns site! twsc: twisted single crochet – See my Tutorial for stitch instructions. (Note: If you do not master the twsc you can replace it with crab stitch, aka the reverse single crochet). Color change: You will change color at the end of each row, alternating the 3 colors, carrying the unworked yarns from row to row. The color change will be made at the last sc of each row, this way: work the last sc till half, having 2 loops on hook, pick new color yarn and finish the sc with the new color. With a 5.5 mm crochet hook and yarn color A chain 35. Row 3: With C repeat as row 2, changing to color A at the end of the row. Rows 4 – 40: Repeat as row 2, always alternating the 3 colors. At the end of row 40 worked with color B, do not change colors anymore and continue with the edging. The edging will be worked in rounds around the piece, joining with sl st at the end of the round. - the 1.st round of edging will be worked in moss stitch; in each of the 4 corner stitches you will work (1sc, 2 ch, 1sc). 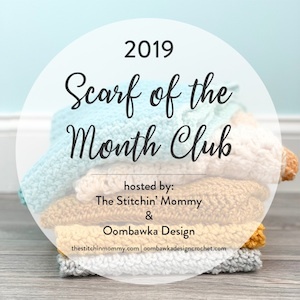 - the 2.nd round will be worked with the same as the first round, but replacing the sc stitches of the moss stitch with twisted single crochet stitches. Round 1: Continue with A, ch2, work 1 sc in same st as the last sc of the last row worked. (half of the corner made). Second side: turn the piece to work along the edge of foundation chain: *ch 1, sk next st of foundation ch, 1sc into unworked/ skipped ch of foundation chain, repeat from * to next corner, work the corner: (1sc, 2ch, 1sc) into corner st.
Side 4: *ch 1, sk first sc, 1 sc into ch1 sp, repeat from * to next corner, 1sc into corner st, ch1 and join with sl st with the first sc of the round (first corner completed). Round 2: Repeat as first round replacing the sc with the twsc (or the crab stitch, if you prefer). Cut yarn. Finish off. Weave in the lose ends. I hope you have enjoyed this pattern! Please do not reprint or repost this pattern, instead link to the pattern, if you would like to share it with others. Do not make video tutorials or translations for this pattern without my written consent. Thank you!